I've been a big fan of Pony ever since I discovered her on Youtube. She's a famous Korean makeup artist, Youtuber, and apparently she's also CL's (from 2NE1) new makeup artist! So, last year when I heard that she was teaming up with Memebox to create her own line of cosmetics, I was super excited. 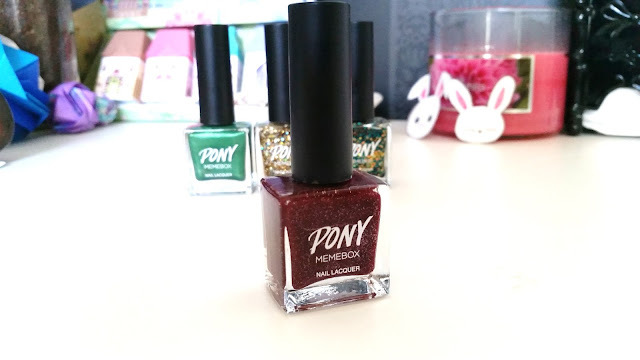 I jumped on the bandwagon right away and bought Pony x Memebox's first eye shadow palette. I ended up really liking the palette, so I knew I wanted to try more products from the Pony x Memebox line. 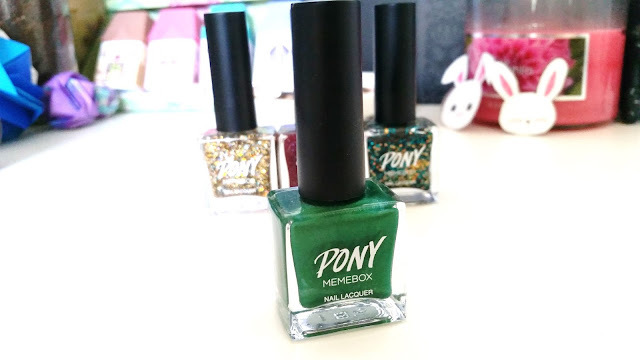 When Pony x Memebox came out with nail polishes, I was ooohing and ahhhing over them. Their colors are nothing new really but they still looked pretty none the less. I'm not a nail artist and I still struggle with painting my own nails sometimes (dammit left hand). However, that doesn't mean I don't love to play with nail polishes from time to time. Mistakes are okay, that's why they made nail polish removers right? Anyways, I got this set of glittery goodness because I don't have these colors yet. Let's get to know them, shall we? 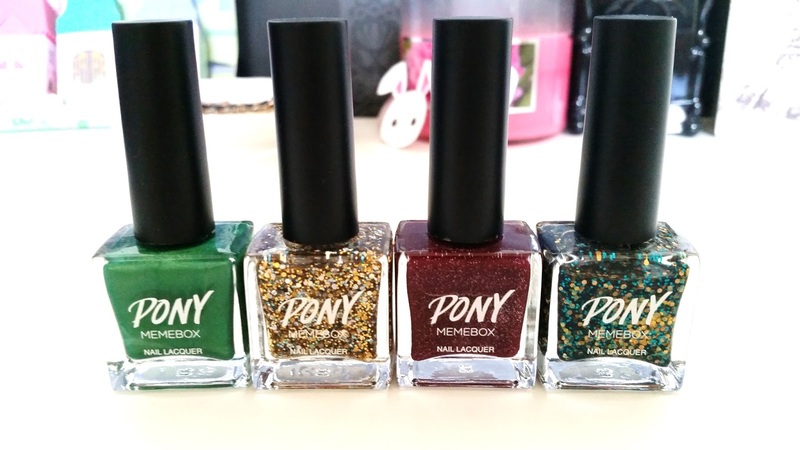 Look at this pretty glittery set. I'll be honest, it's been ages since I bought nail polishes because I can never find the right colors that I want to get. I wasn't even sure if these 4 are the right colors but they looked so pretty and I knew I want to play with them, so I got them. 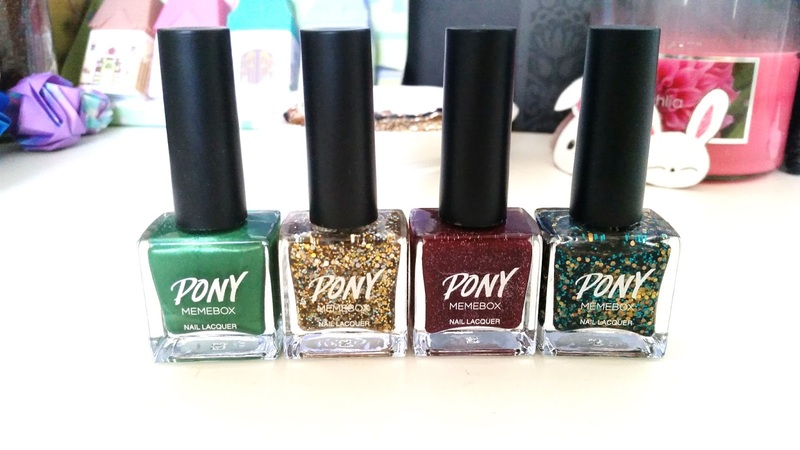 These 4 polishes came in a set and only cost $10, individually they cost $3 each. Pretty darn good price I'd say. Plus, there are always some sort of discount codes flying around, so you can save even more! 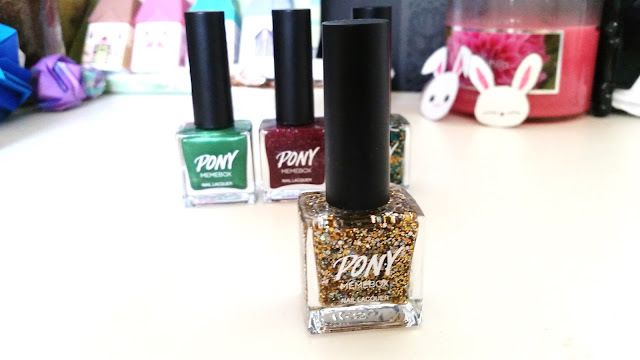 There are 17 polishes from this line right now. So if glitters aren't your things, you can check out the other 13 polishes to see which one you'll like. 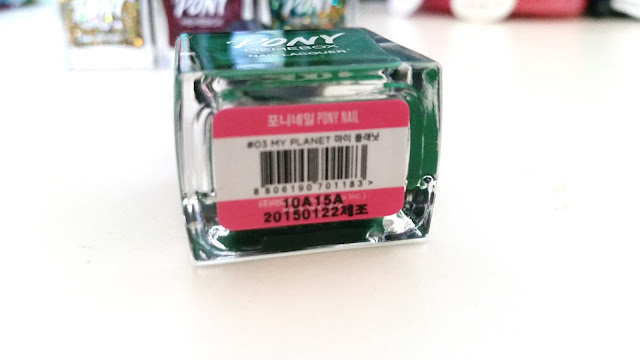 My Planet is a beautiful shimmery green nail polish. The shimmers in the polish are gold and looks dazzling under the light. I didn't know if I would like My Planet at first, since I rarely wear greens on my nails. 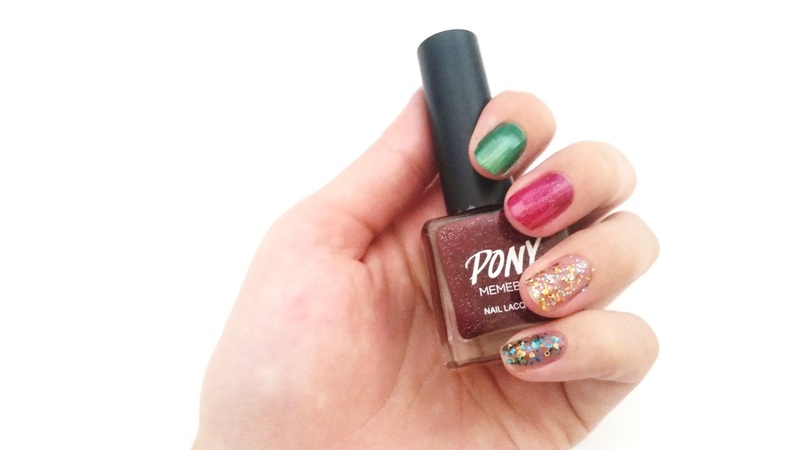 However, I think I was drawn to this color (and this set) because the red/green reminded me of Christmas colors. Who doesn't think about Christmas in July? 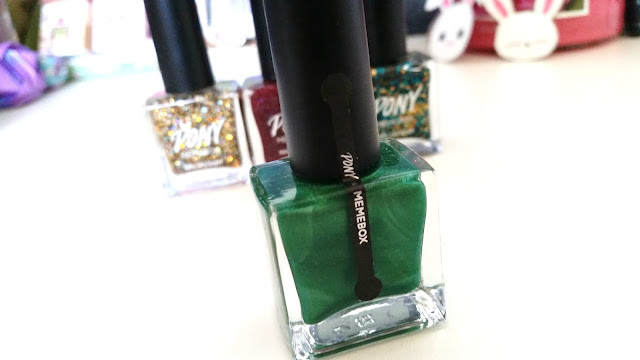 But really, I was drawn towards it because I don't have a color like this and this year seems to be the year to try some new things, including nail polish colors, so why not? All the nail polishes comes with a seal on the back. So you know that it's new. To break the seal, just twist the cap. I did try to peel it off at first but it didn't work out so well. You can peel it off easily after you break the seal. 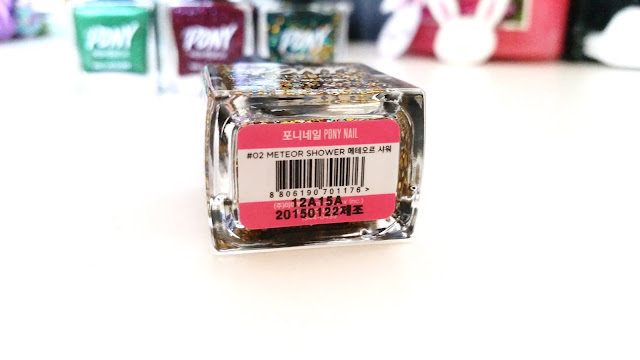 The bottom of the nail polish is where you'll find its name and manufacturing date. Looks like this one was made January of this year. Gorgeous sparkles that mimic the looks of meteor showers. 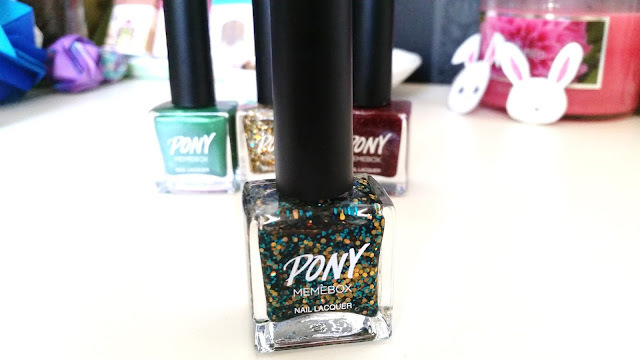 This polish is clear and contains various colors and sizes of sparkles with gold being the main color. I can never say no to sparkles (or in this case Meteor Shower). They might be messy, but they are so fun to play with. I thought this clear sparkly polish could be a perfect pair to many of my nail polishes and I've been eyeing some designs I want to try out that needs sparkly polishes of some sort. I love that this polish contains various sizes of sparkles and colors as well. Even though gold is the main color of sparkles in this bottle, the other colors still shine though. Creating a nice look overall. Rich red maroon color nail polish with tiny glitters. The micro-glitters are finely dispersed in the red maroon color. They are visible but are not stealing the show away from the beautiful red base. I went through a phase of loving maroon color things last year and I still love certain maroon color things. While I've never owned a maroon color polish, wonder why, some where deep down inside I knew I'd eventually get one to play with. So here it is, my Eclipse. When I got it in my hands, I fell in love with it. The color is gorgeous and perfect for the fall. Can't wait to try some designs with it. A clear base polish with chunky glitter particles inside. The glitters are mainly gold and cyan (or a darker version of Tiffany blue) in color. Out of the 2 chunky glitter polishes in this set, I like Worm Hole the most. At first I thought the glitters were green or something but once applied on my finger, it turns out to be cyan. Or, in my opinion, it looks like a richer color of the Tiffany blue, which I love by the way. It was a bit hard to apply the glitters on, so I ended up packing it on instead. What I like about this polish is that it is liquidy, thus even if you pack it on, it won't feel too heavy. Here are the 4 colors applied to my nails. I only did one coat of each and the 2 none clear coat base colors already look really pigmented and nice. Although, I would say that it's probably best to do 2 coats. 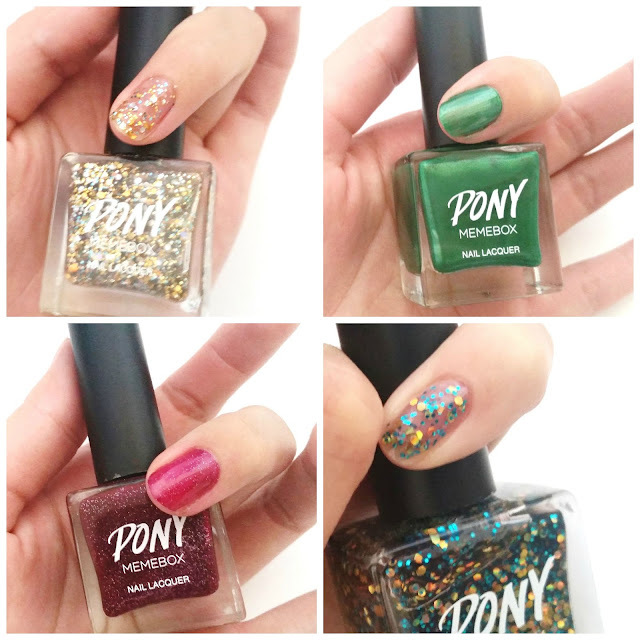 For the chunky glitter polishes, it's best to pack them onto the nails instead of applying it the same way as you apply nail polishes. The formula of the nail polishes are pretty decent. A bit liquidy but I like it as I can apply light layers easily. You definitely need a top coat on top of it to keep it lasting longer. Final Thoughts: I have to say, my favorite polish out of the 4 is the Eclipse. Guess I'm still not over the maroon red trend. But honestly, the color looks a bit magenta in person. Like a maroon red with a hint of magenta. It is beautiful. The micro gold glitters add the perfect touch to the mix making it a perfect fall color. I know I will be wearing this one a lot. Worm Hole is my second favorite polish from this set. The cyan and gold glitters look so pretty. Meteor Shower comes in 3rd because like I said, I always like myself some glitters. Last but not least is My Planet. It's not that I hate the green color. It's just I don't normally wear green and I've yet to decided on how to add it in. However, I did get it because I was to try something new, so I'll play around with it more to find out I guess. 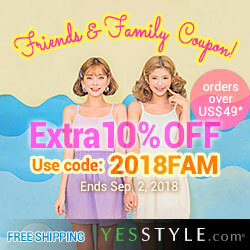 Visit our Deals Page for coupon codes and deals!